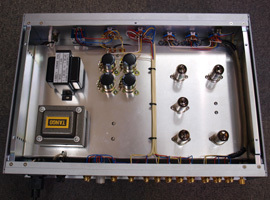 I produce an amplifier more than 30 years, and it meets a Japanese safety standard. However, we cannot easily export amplifiers because an electric safety standard is in each country. We need time for the acquisition of the CE mark. We can sell a product to Japan and the United States now. I considered the usability of the front panel. 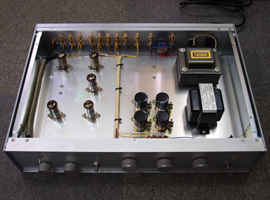 The circuit of this pre-amp is thought about for an LP. It is easy to understand the row of terminals. The terminal is gold-plated. The front and back are aluminum hairlines. Both sides are hammer ton. The top and bottom is a metal plate of the black painting. All the characters are carved characters. ＊The product of Miyajima-Lab may change the design without a notice. The phonoinput of 3 circuits supports plural players. About an upper switch, the change of RIAA curve and the 78rpm curve is possible. The LP which is not RIAA of Colombian blue label / Victor LM series /etc of the initial LP recommends a position of 78rpm. 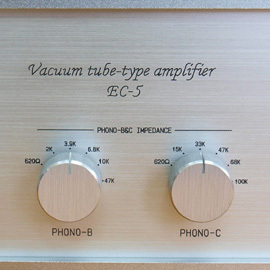 The input impedance of A is standard 47kΩ. B and C can change impedance freely each. The right photograph is a changeover switch of the input impedance of B and C.
An impedance matching improves by matching the impedance of the pre-amp to the impedance of a cartridge and the stepup transformer. When impedance is unclear, please choose 47kΩ. 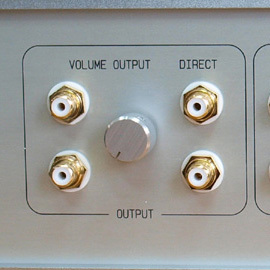 This is the volume and a switch. The materials of all knobs are aluminum. The MODE switch is convenient. There are the output of the single channel and the output of the LR reverse. - 10dB is one-third of normal volume. - 26dB is 1/21 of the normal volume. 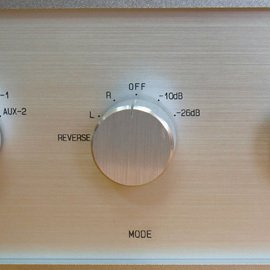 The gain adjustment can fine-tune the volume and is useful as a mute switch. Please change the input of 6 circuits by SELECTOR. 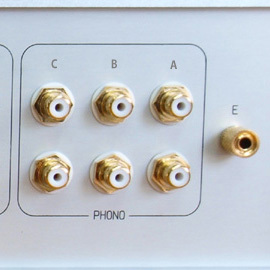 PHONO is divided into 3 circuits more by PHONO SW. 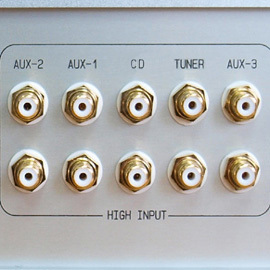 The input of 5 circuits except Phono is convenient. Please use DIRECT of OUTPUT for normal power amp. 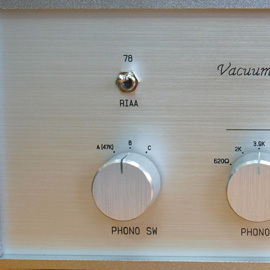 Please use VOLUME OUTPUT for the power amp of the high gain. 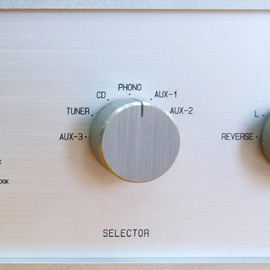 The user is not troubled with the difference in gain of the power amp by controlling a gain by the subvolume. 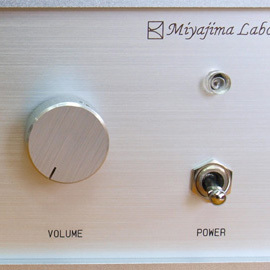 The user can record a sound source without volume relations directly. 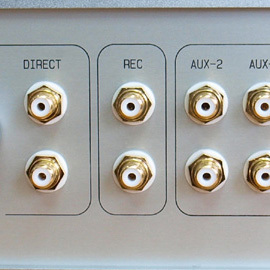 This pre-amp wires signal system with a single wire. The power supply-related cable is far from the signal system. 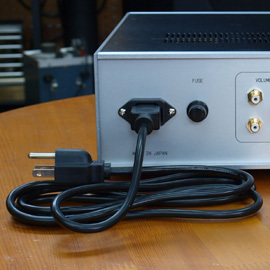 In addition, this pre-amp secures enough voltage by a chalk transformer effectively. I was able to isolate correspondence from the noise of the power supply enough by easy space. The sound quality has transparency / strength / stability. 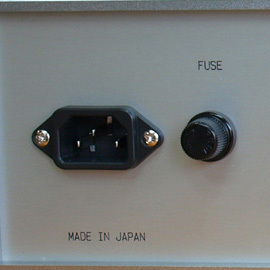 This pre-amp drives various power amp by a mode switch ideally.